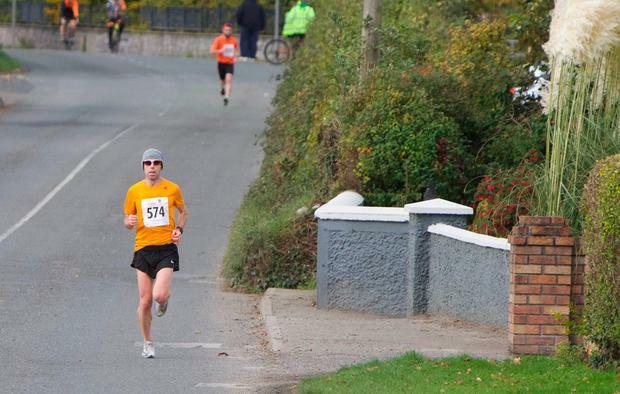 Gary O'Hanlon of Clonliffe Harriers continued his preparations for the SSE Airtricity Dublin Marathon in three weeks' time with victory at the annual Irish 3/4 Marathon held in Longwood, Co. Meath, on Sunday. Last year O'Hanlon, then aged 43, won his first national marathon title in Dublin after his victory in the 3/4 Marathon. In bitterly cold and gusting conditions on Sunday, O'Hanlon and Eoin Callaghan of Star of the Sea AC ran together until the final two or so miles, when O'Hanlon pulled away for a win in 1 hrs 47 mins 19 secs - almost two minutes faster than last year. Callaghan was second in 1:47.46, while a distant third was Alexander Wallace in 1:54.50. Both O'Hanlon and Callaghan are now looking forward to the Dublin marathon on October 28. "It's going to be the toughest race to win in years. Almost everyone will be there - Mick Clohisey, Sergiu Ciobanu and David Flynn, in particular," says O'Hanlon. Paul Pollock, who ran 64:0 at the Cardiff Half Marathon, is opting out this year, while Stephen Scullion, who finished third last year behind O'Hanlon and Ciobanu, has pulled out because of an injury. "If Stephen was running, the race would be for second place," says O'Hanlon. "He's the quality Irish marathon runner at the moment - look at his run in London where he finished in 2:15.55 despite the conditions. A few weeks later he ran 28:36 for 10,000m. I think he's the only athlete around that could go under 2 hours 10 minutes." O'Hanlon was also running in London on that scorching hot day. "We had that terrible winter and then a heatwave in London. I hate the heat and because I wasn't an elite runner, I didn't have my usual drinks. I was 17th overall in 2:21 - normally that kind of time wouldn't get you near the top 20." For O'Hanlon, Dublin will be a fifth marathon this year after London, Cork, Longford and Berlin. "And an ultra - the 50km in Donadea," he points out. However, he picks his races more carefully these days. In the past, he may have ran two tough races in a week, but those days are gone. Eoin Callaghan was delighted to finish second in Longwood behind O'Hanlon. "I've had a few years off with injuries, but I feel I'm coming back into form," he says. Callaghan's official personal best for the marathon is a 2:21.47 from Rotterdam in 2016. He finished third in the Cork City Marathon last June in 2:26.08, where O'Hanlon was the winner, with Peter Somba, the Kenyan who runs with Dunboyne AC, second. Somba will return to Ireland for the Dublin Marathon, as will Freddy Sittuk of Raheny Shamrock, another familiar face on the Irish road running scene who after a few months here over the summer returned to Kenya to fine-tune his preparations for the Dublin Marathon. First woman in Longwood was Caroline Donnellan of Edenderry AC in 2:14.234.